Learning the correct way to ambulate a resident using a transfer belt can make the task a lot more easier not just for the patient, but for you as well. This skill can be very useful especially if your patient is having some difficulty going from a sitting to a standing position and in walking. Not everyone is able to handle this task very well especially when they are not very keen observers or are doing the job haphazardly. This is a very unfortunate yet common practice which can be seen in most nursing assistants who do not take their jobs seriously. 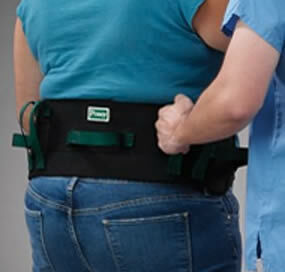 A gait belt or a transfer belt is one that is about two inches wide and has a sufficient diameter to provide enough space for the patient’s waist and for the hands of the nursing assistant to pull them up. Before doing this procedure, make sure that you have greeted and introduced yourself to the patient. It is also important that you discuss the procedure to the patient while you are doing each step for him to be ready for any action or change of position that he or she will be doing. The next step is to remove any object which may cause your patient to slip when he or she stands on the bedside. Put the appropriate footwear also, ones which have a greater traction in order to help avoid any slipping accidents while they are walking. Lower the bed so that his or her feet will be touching the floor when they sit on the bedside. This will make it easier not just for them, but also for you to help them stand from their sitting position. After this, assist your patient to assume a sitting position on the side of the bed. Allow them a few seconds or even minutes to cope and ask how they are feeling. It may cause dizziness for some patients during such activity. If he is feeling fine, begin to put the belt on your patient’s waist. Make sure that is will not touch any part of the skin on their waist and that there is a two-finger allowance in between. This is to make sure that the belt will not be too tight and cause restrictions in breathing. Put the patient’s feet flat on the floor and provide instructions as to the timing when he or she should be starting on stand up. Being in front of the patient, grasp the two sides of the transfer belt from under the patient’s arms and put one of your feet as a brace for the patient’s leg. At a signal, begin to pull the transfer belt while holding your hands in an upward position. As much as possible, tell your patient to do his best to try to stand up to help ease the tension on your back too. Once the patient is stable on his feet, assist them to walk by getting on the side where they have more difficulty walking and slightly behind him while holding the transfer belt.